I love cupcakes as much as the next guy, just take a look at the picture. 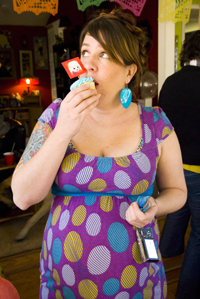 No that big tummy is not from too many cupcakes it’s from 9 months of baby cooking! The only thing I love more than a tasty cupcake is a pretty one. Somehow pretty little cupcakes just taste better. When you hand make your own cupcake toppers they taste the best. This week on I Love to Create we have a sweet tooth! Making your own cupcake toppers is as easy as another of my favorite sweet treats pie. All you need is a theme, a few choice craft supplies and a wee little bit of time. You will never again host a party with naked cupcakes or worse yet ones with store bought toppers after this quickie tutorial. I have made custom cupcake toppers for several different occasions in my time because they are just that easy. 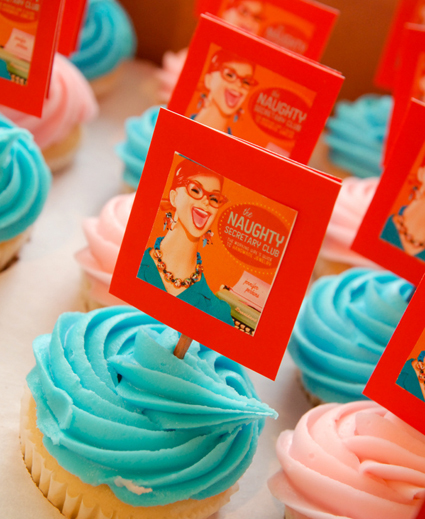 From The Naughty Secretary Club: The Working Girls Guide to Handmade Jewelry book signing party to my Baby Shower the cupcakes have been adorned with custom festive goodness. 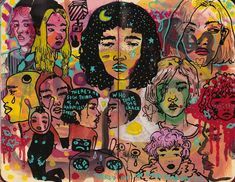 Find the pictures you want and get them onto your computer. Crop the pictures in a photo editing software to the size you want. 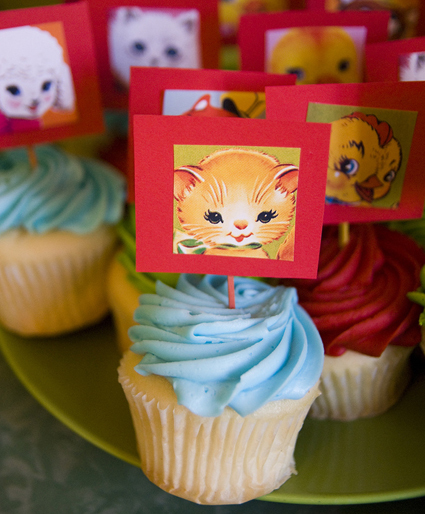 Print as many pictures as you are going to have cupcakes on shiny photo quality paper. Cut your pictures out and set aside. Using your ruler measure out as many colored paper squares as you have cupcakes and cut out with scissors. 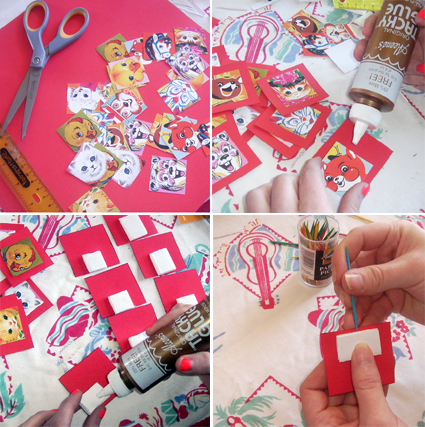 Using Aleene’s Original Tacky Glue attach your colorful pictures to your heavy paper squares and allow to dry. Using your ruler and scissors measure and cut out small squares of foam board. When your cupcake toppers are dry attach foam board squares to back of paper using Aleene’s Tacky Glue and allow to dry. If you want to get really fancy you can also glue another set of colored heavy paper squares to the opposite side so that your foam board is sandwiched in-between and not showing. After everything is completely dry stick toothpicks into foam board and then into your cupcakes for quick and easy adorableness! My husband’s band Beta Valentine had their final show on appropriately enough, Valentines Day and he and I decided to whip up some custom cupcakes for the event. 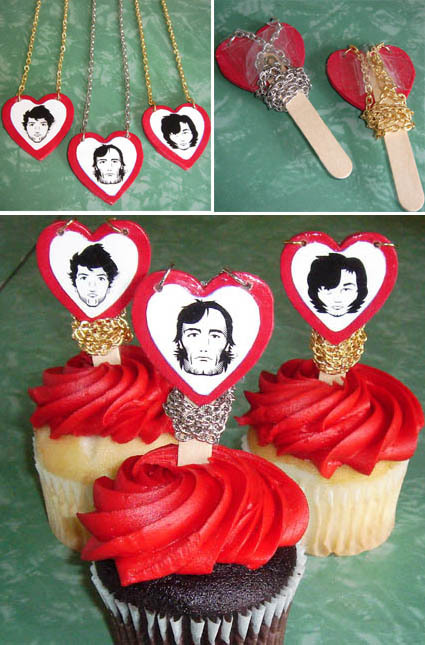 We even made 3 special wearable cupcake toppers for the 2 wives and 1 girlfriend of the band. 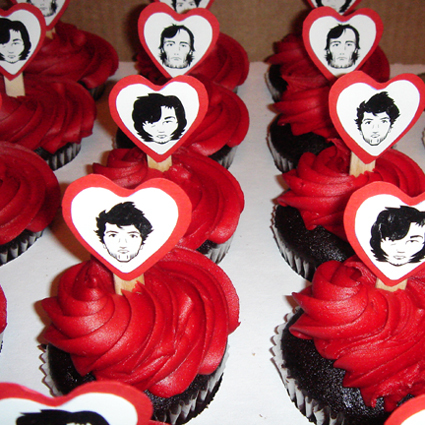 For the cupcake toppers we used an illustrated image of the band by our friend Jeff Conway. We printed up as many of the images on photo quality printer paper as there were cupcakes. Using a heart shaped template we traced hearts around the boy’s heads and cut them out. Using a slightly larger heart template we cut out the same amount of red hearts from heavy card stock. Using Aleene’s Original Tacky Glue Sticks we adhered the white hearts to the red hearts and allowed them to dry. 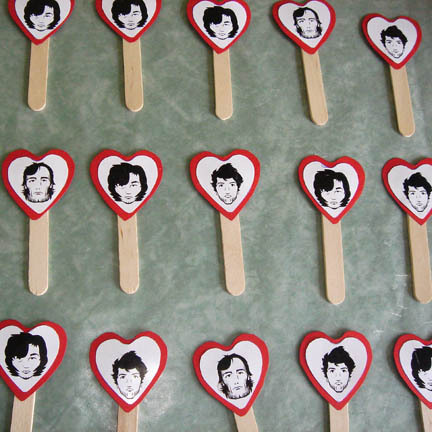 Later we came back in and using Liquid Fusion glue we attached short popsicle sticks to the backs of the hearts allowing those to dry overnight. The next day we stuck them into each of the cupcakes and served. 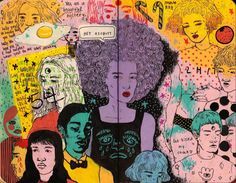 Find the pictures you want and get them onto your computer. Crop the pictures in a photo editing software to the size you want. Print as many pictures as you are going to make special necklace style cupcake toppers. 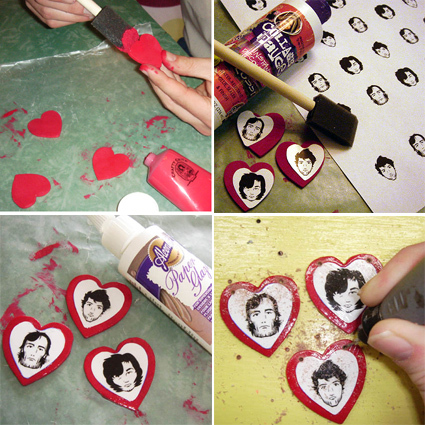 Cut images out in the shape of hearts, slightly smaller than the wooden hearts. Using Crafty Chica paint in red paint your hearts with a sponge brush applying two coats to each side and allowing to dry thoroughly. Once your hearts are completely dry adhere the small heart shaped images to the inside of your red heart leaving a small border of red around the edges using Collage Pauge Instant Decoupage. Allow to dry completely. Next apply Aleene’s Paper Glaze as a protective top coat and sealer and allow this to dry completely. When everything is dry using your Dremel drill with a small bit two holes in either side of the top of your heart. Using your wire clippers snip the very center link of chain in your necklace to make two strands of equal length attached by the clasp. Using your flat nosed pliers and jump rings attach each side of chain to one side of your wooden heart pendant. Presto your necklaces are born! To make the necklace into a cupcake topper use tape to coil up necklace chain and secure to back side of wooden heart & wooden popsicle stick so that it does not get into the frosting. I used packing tape to accomplish this. It’s not that pretty from the back, but you obviously can’t use something permanent like glue or it would ruin the necklace. The ladies were all pleased as punch with their new necklaces, the boys were excited to see their faces on cupcakes and the whole show went off without a hitch. Though everyone was a little somber since it was Beta Valentine’s last show cupcakes with customized toppers can help ease any amount of pain! 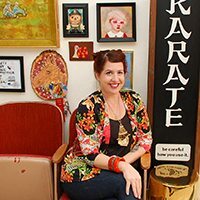 Posted March 12, 2009 & filed under Crafts, Crafty, I Love to Create, Parties. I LOVE the necklace topper. Fabulous idea! Things like this make me wonder why I never thought of it. Thanks for the fantastic idea!!! So glad you like, I was pretty pleased with them! The wrapping the chain on the cupcake stick was the trickiest part, but the rest was super easy. Oh my gosh!! Thank you! JUST in time for my daughters 4th birthday! We are having homemade cupcakes and I really disliked all the toppers that I have seen……now I can make my own! I should have thought of that! Woo Hoo, thank you!!!! DANGIT! I hate that I couldn’t be there! 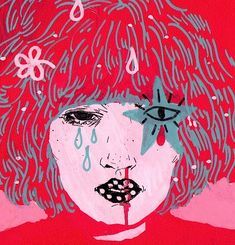 Viva la Valentina de Beta! They probably shouldn’t break up. Mark my words. I will make them play once more. Remember this moment. 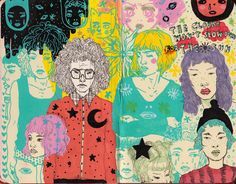 Hey lady…you always AMAZE me!! Thanks for the Collage Pauge love…all that cupcake stuff is making me crave some YUMMY cupcakes. I love the necklaces…YOU ROCK!! Leslie you should totally make some toppers for the bday party. Super duper easy and the kids will love em! Travis I’ll tell the boys you said so. Traci I know I’m hungry for cupcakes too! My secret is I get them at Sams. Everyone asks me for the recipe they are so good, plus they are 30 for $11! What a great idea! Love it!!! I love that these are so “do-able.” I also love a good cupcake too! i love the red on the choc cupcake and the love heart toppers are so cute!! 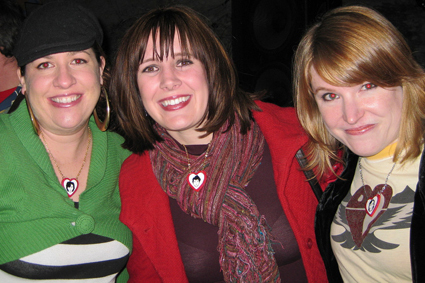 The necklace toppers are totally rockin’ my world. I used your idea and did necklaces and buttons for my boyfriends 30th birthday. They were a huge hit! That sounds adorable, send me a link with pictures if you have any! Oh, I love this! I have seen so many cup cake toppers on etsy.com! I would love to do this – do you know if there is a program out there to get all the fonts and clipart?